Do you like the outdoors? Do you love riding horses? Are you needing to de-stress or find an outlet from chaos of the everyday grind? 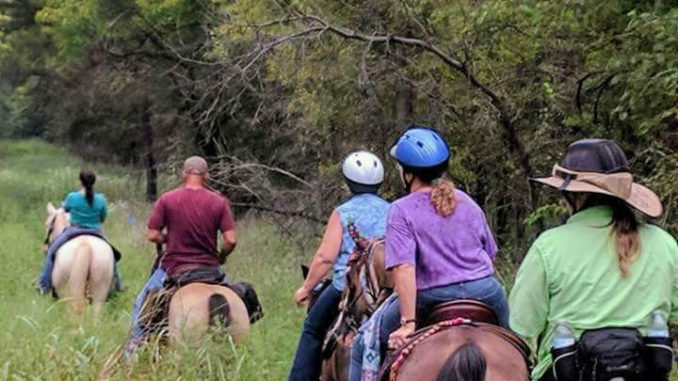 Combine them all and see the trails and roads less traveled in North Texas from the seat of a saddle while horseback along some of the best trails North Texas has to offer. When it became aware to avid trail riders that trails across the great state were becoming sparse, it propelled a movement in informing, educating and maintaining trails throughout the state. As a result, more avenues for information emerged, clearer more detailed information about specific trails transpired as well as maps and readily available resources for the beginner to the devoted trail riders. While every rider rides for different reasons, every trail is different. Fortunately, there are enough in the North Texas area to keep all riding the path they so choose. Every trail varies on degree of difficulty, entrance fees, distance, camp site availability, amenities and more. Michelle Ellis of Denton, Texas, has been trail riding since childhood, but bought her first horse at age 34. As a proponent of trail riding and advocate to keep trails maintained, she is a great source of trail riding info. Why do people trail ride? As an experienced trail rider, what do you look for in a good trail? Are there some trails that allow for overnight stay? Are trails marked with level of difficulty? If so how do you discern your ability? To read more pick up a copy of the August 2018 NTFR issue. To subscribe call 940-872-5922.